Our first day out of Livingstone and the start of the Elephant Highway. We had a very easy day ahead with just 80km of riding and then a planned trip on the river in the afternoon to see some game once we had crossed from Zambia into Botswana. My three friends – Angela, Sam and Amy – had assembled their bikes, swallowed their first day nerves and porridge and we set out nice and early. 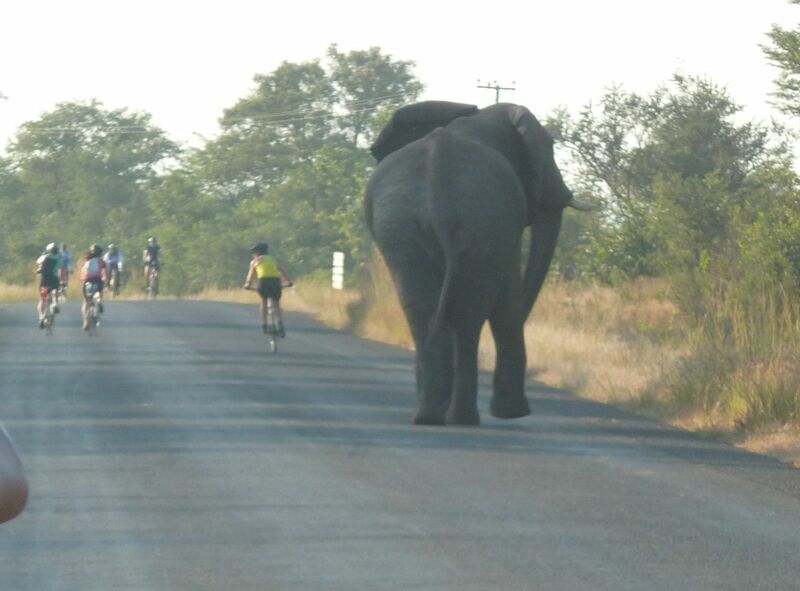 About thirty minutes into the ride, cyclists ahead said they had seen an elephant in the bush. Obviously, we were excited but I was also a bit nervous as elephants are big and fast and can do you a lot of damage. So, we all stopped to see what was happening. I was fumbling around in my bag, getting out sunscreen and camera when Angela said she would ride on. I had no idea she was saying that because she could see the elephant right opposite us in the bushes. Next moment, it is charging out towards me. I dropped my bag, grabbed the bike and started pedalling as fast as I could away from it. It was trumpeting and flapping its ears and looked very scary from where I was. My heart was going like mad. I knew that I had no chance of out cycling it, if it really was intent on some damage. Clearly, since I am writing this blog, it wasn’t but was just warning us off its patch. Once we had got far enough away it stopped and eventually retreated. Ten minutes or so later, we biked on past and I retrieved my bag, and some measure of calm. That night, TDA brought in an elephant expert and also a big game hunter to tell us what to do over the next three days if/when we encountered any big game on the road. Basically, the rule was to stay 100 metres away and not to cause any annoyance or disturbance. If you did get charged by anything, they said we should get out of there as fast as possible, and also to dodge and weave about as elephants can’t manouevre easily. Over the next section, lots of riders did see game – elephant, buffalo, warthog – but I saw nothing else except a big baboon sitting in a tree. Botswana passed in a dream of long, flat, tarmac stages (averaging 160km each). And it was a relief to get into Namibia even though we were met by vicious headwinds and even more vicious hailstones. The scenery is beautiful again and Windhoek is lovely. Garnering motivation for the next stage – sand and off road. Sounds like you had “fun” with the elephant! Well, if I understand the route, you are soon to be on the last stretch to Capetown – it must seem that the past months have flown by and equally have taken an age to pass. I hope that you enjoy the last weeks of your epic trip and look forward to seeing your remaining blog entries. Keep strong and keep having fun in the last few days.